Jumping with my Fingers Crossed: The Pulse of Compassion- "Give A Minute, Help Make-A-Wish"
The Pulse of Compassion- "Give A Minute, Help Make-A-Wish"
Standing in line at the store, I heard a beeping noise. Beep. Beep. Beep. My pulse started racing and my eyes filled with tears. It was the same sound we had heard in the hospital. Haunting me. Reminding me of loss and sadness. The anxious feeling only lasted around 10 seconds and then I went back to shopping. I pushed my cart forward and my anxiety deep inside and carried on. Beep, beep, beep....over and over. It was quiet, but it was there beeping like the ticking of a clock or some ominous sound from a dark and twisty Edgar Allen Poe poem. Beep, beep, beep. It was coming from machines keeping people alive, machines checking the blood pressure and heart rate and IV fluids and everything else that needs checking. We waited for the doctor while the beeping beeped. While we waited for confirmation that my pregnancy was over, we felt powerless. We didn't talk much. We held hands. We held onto what was good and true and full of love. We held onto each other. Our bond grew deeper and so did our compassion for people that have to feel these feelings of fear and worry for their family. Parents of chronically ill children who sit and listen to the beeping while holding onto hope that their children will get better. Having to parent through their heartache. Beep. Beep. Beep. A haunting reminder of a reality that doesn't make sense. Last week, we were in the hospital again for Lucy's punctured finger (a nasty splinter that needed a doctor's attention). She asked about the beeping machines. She asked about all the machines and screens and charts and tubes in the room. While we waited for the doctor, feeling powerless, I held her hand. I held onto what was good and true and full of hope and love. Once again, my heart grew with compassion for any child that has to face illness and fear and uncertainty. Beep. Beep. Beep. A constant reminder of being afraid. I don't want to be haunted by the beeping forever. I don't want to relive that feeling of powerlessness. I want to remember my feelings of empathy and love for families and children who are sick and hurting. I want to do something...I want the beeping to represent a reminder of love. A pulse of compassion. I want to hold onto each other. And I can, and you can, we all can. This month, YOU can also help raise a million dollars for Make-A-Wish. You've heard of Make-A-Wish right? Make-A-Wish grants the wish of a child diagnosed with a life-threatening medical condition. They help ease the pain and the worry. They are about joy and love and holding onto what is good and true. For the second year in a row, StraightTalk is hosting "Give A Minute, Help Make-A-Wish" promotion to raise the million dollars (Click here for more information bit.ly/Straighttalkwish). 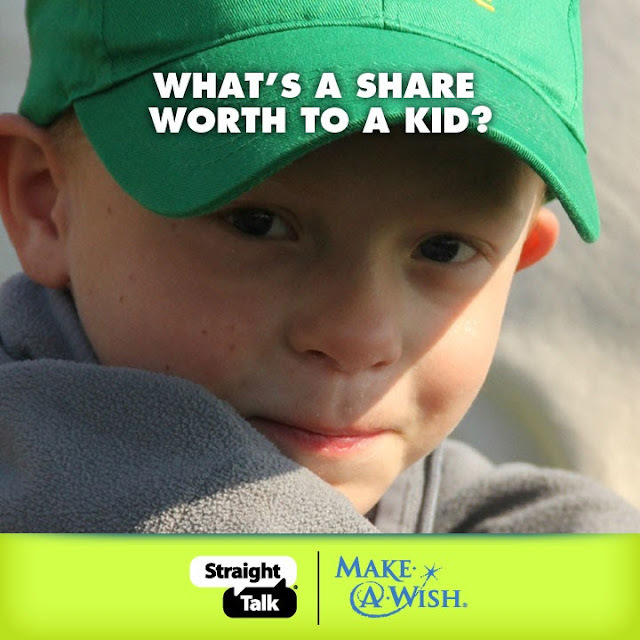 Every Saturday in September, Straight Talk Wireless will donate $1 to Make-A-Wish for each person that visits their participating local Walmart and takes a minute to learn more about Straight Talk. 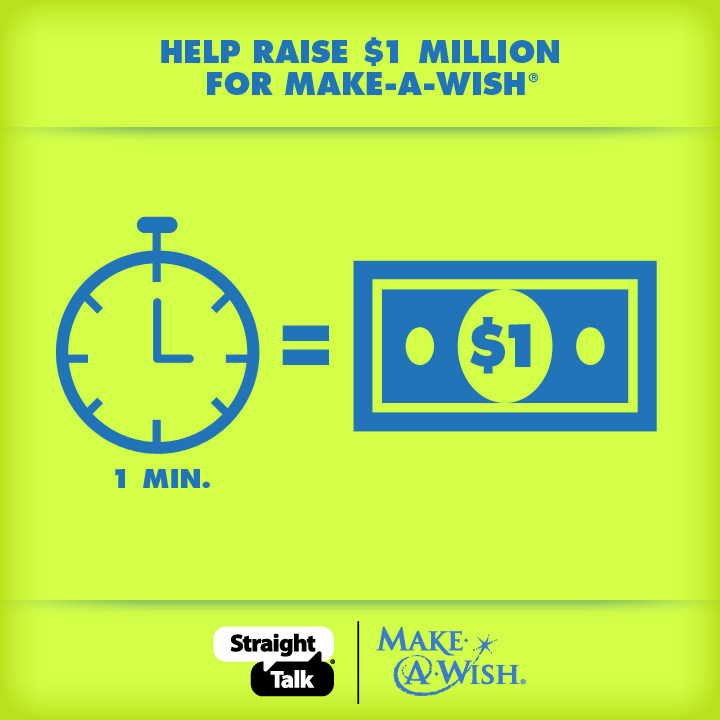 Straight Talk will donate a minimum of $500,000 to Make-A-Wish and up to $1,000,000. Don't live near a Walmart? Really? No worries. From now until September 28, when you share the video on straighttalkwish.com, Straight Talk will donate $1 to Make-A-Wish®, up to $100,000 (one donation per viewer, per day) towards their $1,000,000 goal. It's fast, easy and worth every second! Straight Talk is a service provided by TracFone Wireless Inc., America’s largest no-contract cell phone provider in the U.S.
Straight Talk is available exclusively at Walmart and the cost savings of not having to maintain stores is passed directly on to customers. Straight Talk has all of the same phones as the contract carries, including name brands like Samsung, Apple, Windows and LG. The “ALL YOU NEED” plan for $30 a month to receive 1,000 minutes, 1,000 text or multimedia messages, 30 MB of data transfer for data phones and 411 calls at no additional charge. Because you took one minute to learn more about Straight Talk more sick children will have wishes granted. Beep. Beep. Beep. The sound resonates now less like a scary, sad reminder of loss. Now it can be more like the beating of our collective hearts full of love...the pulse of compassion. I participated in this sponsored campaign for One2One Network. but all opinions stated are my own. wow, what great advice and so true. I never ask for help when I most need it. But tell me you're bringing dinner over and I won't say no. we really all can make a little difference.